Over 15 years, four women in Lake Oswego, Ore., a wealthy Portland suburb, sought police protection against the same man, court filings show. "He threatened to burn down my house with me in it," one woman wrote in her application for a restraining order. "I don't know what he's going to do next," a second wrote. "He choked me so hard it left a mark on my throat," wrote another. "He is scaring my children and me," a fourth woman said. Yet the man, Douglas E. Greenberg, remains one of Morgan Stanley's top financial advisers — and a celebrated member of the wealth management industry. A Wall St. Executive's Downfall Seemed Sudden. It Was Years in the Making. For years, Morgan Stanley executives knew about his alleged conduct, according to seven former Morgan Stanley employees. Morgan Stanley received a federal subpoena related to one abuse allegation, according to a lawyer for one of the women. In another instance, a Morgan Stanley manager alerted his superior when Mr. Greenberg was charged with violating a restraining order, according to three former employees. Another manager at the firm liked and replied to a Facebook post by one of Mr. Greenberg's ex-wives in which she described his abuse. On yet another occasion, an official from the bank's New York headquarters flew to Portland to investigate, two former employees said. Despite this information, Morgan Stanley apparently took no action against Mr. Greenberg. He is still an employee and a member of the elite "Chairman's Club," which recognizes brokers who not only are top producers but also meet certain "conduct and compliance standards." The wealth management division in which Mr. Greenberg works represents the future of Morgan Stanley. The company's chief executive, James P. Gorman, wants the division to supplant the volatile investment banking and trading businesses that until recently were the bank's profit engines. Wealth management now accounts for nearly half of the bank's total revenue. Mr. Greenberg is in the top 2 percent of brokers at the firm by revenue produced. Last month, he made a Forbes list of Oregon's top wealth managers. This week, after The New York Times contacted Morgan Stanley with questions about Mr. Greenberg, the bank put him on "administrative leave pending further review of this situation," said a Morgan Stanley spokeswoman, Christy Jockle. "We are committed to maintaining a safe and professional work environment and will take appropriate action based on the facts of the matter." Reached on his cellphone this week, Mr. Greenberg said he had no comment. "It's interesting that a reporter from New York would somehow have all this information just on her own," he said. He did not respond to additional detailed requests for comment. Since claims of sexual harassment in the workplace ignited the #MeToo movement last year, companies have been struggling to handle accusations against star employees. Fox News, for example, granted a four-year contract extension to the anchor Bill O'Reilly soon after he paid $32 million to settle a sexual harassment claim against him. Morgan Stanley has wrestled with the issue, too. Late last year, the bank fired a top investment banking executive, Harold E. Ford Jr., after hearing accusations that he had engaged in misconduct. The bank later said that Mr. Ford, a former Tennessee congressman, was not fired for sexual harassment. Mr. Ford has denied any wrongdoing. None of the women Mr. Greenberg is said to have abused were employed by Morgan Stanley. But employees in the finance industry — especially those who manage money for clients — are judged in part on their character. That puts the onus on companies, and regulators, to police their conduct even outside the office. Financial advisers like Mr. Greenberg have to share certain information about themselves publicly, under rules intended to help investors find trustworthy money managers. For example, brokers have to inform the Financial Industry Regulatory Authority, known as Finra, if they declare bankruptcy or are charged with any felony or with a misdemeanor related to money. But there is just as much information that does not have to be disclosed — and that means that people with checkered histories can continue to thrive in the industry. On Finra's website, each broker's history is displayed in a vertical timeline, with red dots marking the date of each trouble spot. There are five red dots on Mr. Greenberg's timeline. They represent a 1984 charge, eventually dismissed, of theft by check; a 2001 charge of criminal mischief in the first degree, also dismissed; two disputes with clients; and a regulatory penalty. Electronic signage at the headquarters of Morgan Stanley in New York. But that record does not reveal Mr. Greenberg's other run-ins with law enforcement and the judicial system, which are not required to be disclosed to Finra. In 2000, Mr. Greenberg admitted in an arbitration proceeding that he had phoned someone who did a lot of business with a colleague and told him, inaccurately, that the colleague was known for shady business practices, according to a record of the proceeding. Mr. Greenberg was not punished for what the three-person arbitration panel deemed was defamation because the statute of limitations had expired, the panel said in its decision. In December 2006, Mr. Greenberg was charged with harassment and criminal mischief, according to court papers and a police blotter item in The Lake Oswego Review. He had violated a restraining order taken out by his ex-girlfriend, the second woman to ask for protection against him, according to the court papers. Mr. Greenberg eventually pleaded no contest to a misdemeanor charge of criminal trespass and agreed to limitations on his movements, according to a plea deal reviewed by The Times. And eight years later, Mr. Greenberg was charged with violating another restraining order taken out by a different ex-girlfriend. The woman, Anne Cost, had obtained the order against Mr. Greenberg after, she said, he threatened to burn down her house. Now, she told the police, Mr. Greenberg was menacing her again, trailing her in his car. 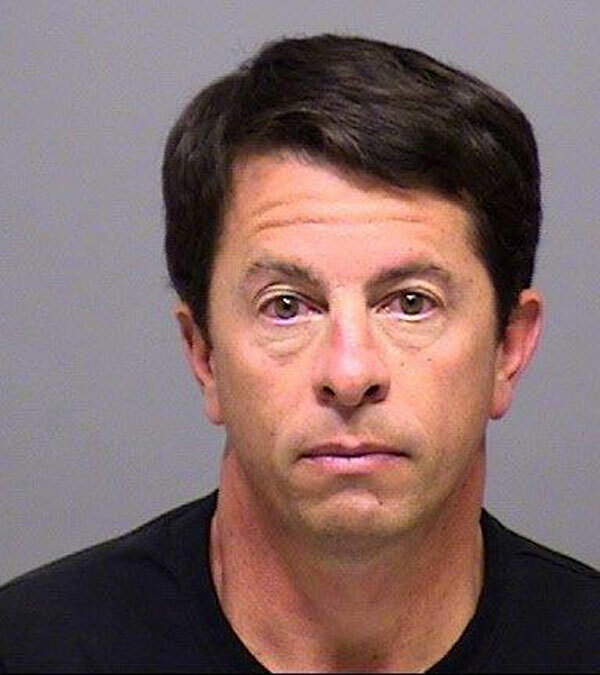 "You could have placed a pizza box between her back bumper and Mr. Greenberg's front bumper he was so close to her," a Lake Oswego police officer, John J. Brent, wrote in his report of the incident, which was reviewed by The Times. Ms. Cost declined to comment. After that September 2014 arrest, Mr. Greenberg's mug shot appeared online in a report about the arrest. Morgan Stanley employees in Seattle and Portland shared it via text messages and emails, according to the seven former Morgan Stanley employees, most of whom said they did not want to be identified because they feared retribution by Mr. Greenberg or the bank. "Everybody knew," said Jani Beatty, a former vice president at Morgan Stanley's private bank. She added, "I considered him my friend until I understood the full extent of his actions against his intimate partners." When he learned of the arrest, Paul Amsbury, a Morgan Stanley branch manager and Mr. Greenberg's boss, passed information about it, including the mug shot, to Curtis Peterson, the firm's Pacific Coast regional director, in San Francisco, according to Ms. Beatty and two other former bank employees. Mr. Amsbury's message: Mr. Greenberg was not fit to represent Morgan Stanley and should be dismissed. Mr. Amsbury declined to comment. Mr. Peterson did not respond to requests for comment. Morgan Stanley officials soon were confronted with more issues involving Mr. Greenberg. In June 2015, his second ex-wife, Traci Williams, wrote a series of Facebook posts that described her ex-husband's alleged physical and verbal abuse. The posts did not name Mr. Greenberg, but there was little doubt about whom she was referring to. Her friends commented on the posts and criticized Mr. Greenberg by name. And a lawyer for Mr. Greenberg complained about the posts to Ms. Williams's lawyer. Among the commenters was Alex Burlingame, a Morgan Stanley manager in Seattle who had worked with Mr. Greenberg for years. He "liked" the post and added a personal message: "Hang in there, Traci! So sorry to see that one acts this way. Nancy and I r thinking of you!" Mr. Burlingame did not respond to requests for comment. That summer, Ms. Williams said she started receiving what she perceived to be threatening letters in the mail. "I CAN SEE YOU," read one message made up of letters cut out from magazines. She reported the harassment to the Portland police, who opened an investigation. Their main suspect was Mr. Greenberg, according to emails between Ms. Williams, her lawyer and a Portland police officer that were reviewed by The Times. The police eventually turned the case over to federal prosecutors, according to a July 2015 email to Ms. Williams from the Portland police officer. The United States Postal Inspection Service was also part of the investigation. One day in early 2016, federal authorities showed up at Mr. Greenberg's Morgan Stanley office to serve a subpoena related to the investigation, according to Edie Rogoway, Ms. Williams's lawyer. On March 1, Greg Nyhus, an assistant United States attorney, said in an email to Ms. Rogoway, reviewed by The Times, that his office was reviewing documents obtained from several subpoenas. A spokesman for Mr. Nyhus's office declined to comment. Ms. Williams, meanwhile, asked her lawyer to complain to Morgan Stanley that Mr. Greenberg was making it hard for her to access her children's Morgan Stanley wealth management accounts. Ms. Rogoway said she spoke to a Morgan Stanley lawyer, Bernard Kornmehl, about the accounts. Mr. Kornmehl declined to comment. She said she told him that Mr. Greenberg had a history of abusing women. Later that day, Ms. Rogoway emailed Ms. Williams about the conversation. She reported that Mr. Kornmehl had said that "many sides" were aware of Mr. Greenberg's alleged history.